JELL-O Pudding Finger Paints are easy to make, fun to use and have this added bonus: You won't freak out if someone accidentally gets some in their mouth. Beat pudding mix and milk with whisk 2 min. ; spoon into 6 muffin pan cups. Stir different color food coloring into pudding in each cup. Use fingers to paint pictures with pudding on sheets of construction paper or parchment paper. Let dry completely. To prevent staining, have your child wear an art smock or apron when painting. Use small paint brushes instead of fingers for painting. Line the area your child will be painting in with newspapers or garbage bags. 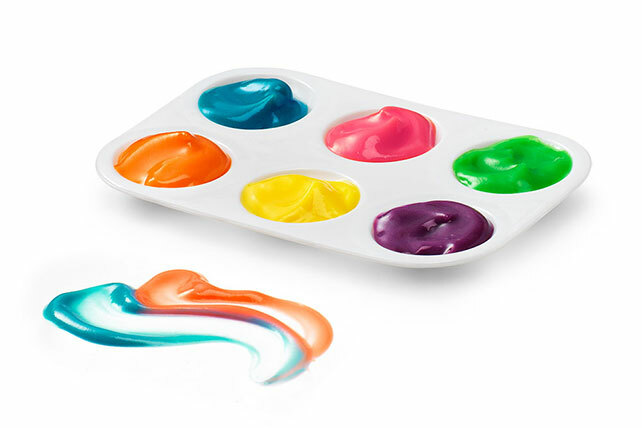 These fun-to-use JELL-O paints can be prepared ahead of time. Refrigerate up to 24 hours. Stir before using.